PEEK’s (Polyether etherketone) unique properties allow it to be used in highly demanding specialty applications where other materials would not be suitable. With superior chemical resistance and high mechanical strength, PEEK is a suitable replacement for metal components in harsh environments. Its high resistance to thermal degradation allows for the retention of mechanical properties at temperatures in excess of 250°C. PEEK is also considered to be one of the safest biomaterials. This has enabled its use in the medical industry as implants and can withstand over 1,000 Mrads of irradiation without any significant property reduction. 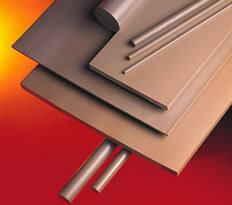 Macplas LTD is able to supply a range of PEEK solutions in sheet, rod and tube form. Reinforced with 10% of each PTFE, graphite and carbonfibre. Very good friction and wear and tear properties. Reinforced with 30% glass fibre.